We have been in Spain about ten seconds. And I am being run over. I started our last post by saying that I don't believe in the concept of evil. It would be easy to portray this man—the one actively running me over—as a deranged sociopath. Really though, the guy is probably just having a bad day. His bad day has probably been made worse by sitting in standstill traffic for the past two or four or ten hours. Driving a vehicle does crazy things to our psyche. It dehumanizes us and the people around us. It makes us petulant. So, I get it, a little. I understand why I'm being run over. But still. I need to make it stop. I am banging on his hood, his windshield, his mirror. Lauren is screaming for him to please stop from across the street. I am shouting, too. I am shouting and flailing my right arm and smacking his car with my left one and also trying to heave my heavy, loaded bicycle from between these two vehicles, partially submerged beneath one of them. All the while, he watches me blankly. I finally break free. I hurry off and rejoin Lauren on the other side of the road. The driver successfully closes the gap between his vehicle and the next, their bumpers now kissing. He seems satisfied. That's all he wanted. I think my bike is okay. I'm very shaken, but otherwise okay. Horns are blaring and it's not really a soothing place to take a breather. We continue into Ceuta. Fifty meters ahead we come to a stoplight. Lauren stops and I stop behind Lauren. A woman in a sedan makes a left turn into the lane behind us. Her front bumper crashes slowly into my back wheel. I turn around, startled. She shrugs, blankly, still inching forward and pushing me with her. You are in my way. What can I do but drive my vehicle into you? If this is Europe, please, take me back to Africa. We are, of course, still in Africa. Spain, Africa. We pedal (no more collisions, thankfully) into the crowded center of town. It is getting dark, and we're looking for a place to camp before catching a ferry to the Spanish mainland in the morning. In the rest of Africa, finding a place to camp was never much trouble. We'd ask at police stations or schools or farms or gas stations or auto shops or villages, and people would say, Sure, of course you can camp here. What, a little land for a night is all you need? We have plenty of space for you. We are not in the rest of Africa anymore. Lauren inquires at the Ceuta police station about camping possibilities and they recommend we find a hotel. We ask down at the port about a place to pitch our tent if we have tickets for a morning ferry. A waiting room or something. No way, they say. Try a hotel. It is now dark. Lauren and I are standing outside the ferry terminal arguing with one another about what to do, and why the hell we came to Europe in the first place. This is the first time in six months we have truly been at a loss for a safe place to sleep. Hotels here are wildly out of our budget. Of course we can get one for tonight if we really need. But if this is a harbinger of what Europe has to offer, we're in trouble. Our budget can't accommodate these prices night after night. Across the Strait of Gibraltar lies Algeciras. It is bigger than Ceuta. It is not far. An hour's ferry ride at most. There will be hotels there too. Probably more than here. Possibly cheaper than here. Supply and demand, or something. It is already dark, and we have already exhausted our options in Ceuta. We try our luck and enter Europe. It's a quick ferry. We're stressed and we're given little time to relax. Five hours ago we were eating bread and olive oil on the beach in Morocco with Ceuta just a hazy mirage in the distance. We were content. Excited. Happy. We had it so good. In the past five hours, I have been hit by two cars. We have wanted nothing more than a place to camp—one we'd gladly pay for—and we've been rejected by everyone we've asked. The blaring of car horns is still ringing in my ears. We are not happy with one another, not happy with our predicament, and not happy with the rushed manner in which we've left Africa behind. But here we are, like it or not. Europe. We're stressed because it's dark and because we're tired. But we're also stressed because it's three days until Christmas. Christmas Eve Eve Eve. It is the holidays, and excepting each other, we are very far away from anyone we know. You miss a lot when you go on a trip like this. You miss the little things: dinners with friends, parties, game nights, casual lunches, picnics in the park. You miss the big things: weddings, engagement parties, baby showers, births. And holidays, too. You miss celebrating holidays with people who celebrate those same holidays. People you know and love. I'm not big on holidays for all the commercialization they've been saddled with, but I of course enjoy the coming together of people over a shared meal or shared occasion. We both do. More or less, we all do. This will not be the first Christmas we've spent away on a trip. Nor will it be the first holiday we've spent away on this trip. But having been away from anyone we know for six months, having spent Thanksgiving just the two of us at a campground in Tanzania, and having no plans nor place to enjoy Christmas and New Year's Eve here in Spain, we're feeling a little lonely. Unmoored. Homesick, maybe. Wandering the streets of Algeciras looking for a place to sleep doesn't make us feel much better. There are, certainly, plenty of differences between Europe and Africa. The buildings look different, the roads look different, the people look different. I won't list them all. We're struck by a broad sense of culture shock, walking these cobblestone streets. But what hits us most viscerally is our own position in this strange new world. In Africa, we were two funny-looking light-skinned people on shiny bicycles, cycling through places where folks don't see people like us too often. We were different. And this came with some uncomfortable realities—the shouts of mzungu!, the begging for money, the way-too-complex-to-unpack-right-here feeling of vacationing through a land your ancestors helped pillage. But mostly, different was a privilege. Different meant being taken care of, being a guest of honor, being the recipient of more kindness than you felt you deserved. Different meant you're clearly not from here; let me help you out. In Europe we are different as well. We are two funny-looking people on dirty bicycles, skin bronzed by months out in the sun. We are carrying all of our belongings with us, which is not very much. Our clothes are dusty and we do not smell wonderful. In a crowded street of plush pea coats and pressed shirts and freshly cleaned faces, we stand out. I hesitate to call us homeless, because the term carries the assumption of inescapability. One is homeless because they have no choice but to be homeless. Having worked on matters of homelessness for seven years before quitting that job to go bike around the word, I understand that this is not true. Some people do not live in homes because they do not want to live in homes. For some it is a choice. For many others it is not. Still (even being deemed legally homeless for more than five years for living in an off-grid tiny house back in Washington, DC) I'm hesitant to appropriate the label. But sometimes it just fits. In Africa we never felt homeless. We felt like travelers. Adventurers! A little dusty at times, sure, but dust is what adventures are made of, right? In Europe, day one, we just feel homeless. People look at us like we are homeless. And it does not feel good. We are looking for a place to sleep. That is all. Four square meters of ground. We'll pay for it. Five euros, ten euros. Fifteen euros if we must. Or free is fine too. Just something marginally legal and marginally safe. We ask police officers. There is no camping in town, they say. We ask at churches. We've never camped at a church, but we know plenty of other travelers who almost exclusively camp at churches. It is, after all, a few days before Christmas. And we are, after all, two weary travelers seeking a manger. Lauren approaches a woman standing outside a regal old church. She's dressed well. Very posh. Parishioners nearby are transferring colorful boxes of wrapped gifts from their trunks into wheelbarrows, and shuttling these into the church's side entrance. Excuse me, Lauren asks, do you work for the church? The woman smiles proudly. "La iglesia es mi vida." "Is there, by chance, somewhere we could sleep on the church grounds? Inside, outside, whatever. 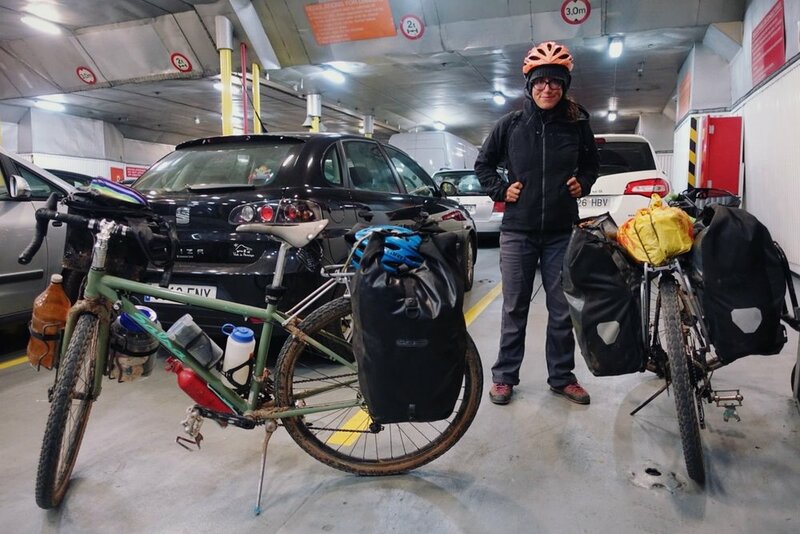 We're traveling around the world by bicycle and just arrived in Europe and are having a really hard time finding anywhere to camp and—"
"Uh, no." She literally turns up her nose. Her mouth doesn't say it, but her face does. Vagrants. Now, let me be clear. We're a pair of tremendously privileged people off on a little adventure. We can afford a hotel if we really need one. It is not the problem of the people of Algeciras to find us a place to sleep. We are victims of our own unpreparedness, nothing else. Other people have lives to attend to and churches to maintain and family to see right before the holidays. We are not their responsibility, and I'm certainly not judging anyone in the city of Algeciras for not being more helpful. We're just bummed. We didn't expect this. And I worry that if we concede defeat on our very first night in Europe, tomorrow will be no better. Nor the day after. We agree to look around for another fifteen minutes before booking a room at the cheapest place we can find. We trudge on. Right next to the church is a park. The park is filled with perhaps a hundred locals having what looks like literally the most joyous time imaginable. They are singing Christmas carols and drinking hot cocoa and eating pastries. They are surrounded by friends and family. They are smiling and laughing and very evidently happy. They are the embodiment of Christmas cheer. We stop and look at the scene before us. It's like in every Christmas movie ever made, where the protagonist hasn't made it home in time for Christmas or something and is instead walking alone down an empty road with twinkling red and green and white lights strung up on all the lamp posts. And he stops on the sidewalk and turns left and sees a family's dinner table perfectly lit through a big bay window. Kids, laughter, steaming plates being brought out from the kitchen. Love through double-pane glass. A fire crackling in the den. This is us right now. We are that trope. We are the outsiders looking in, the lonely individuals with faces pressed up against the window pane. We just want a family to celebrate the holidays with. "Hey," a voice calls from the edge of the park. "Do you need any help?"